You may start exercising the muscles of your foot right away by gently stretching and strengthening them. Frozen can roll: Roll your bare injured foot back and forth from your heel to your mid-arch over a frozen juice can. Repeat for 3 to 5 minutes. This exercise is particularly helpful if it is done first thing in the morning. 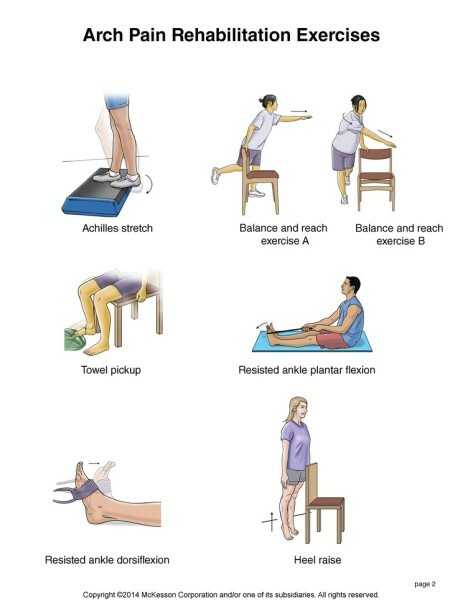 Seated plantar fascia stretch: Sit in a chair and cross the injured foot over the knee of your other leg. Place your fingers over the base of your toes and pull them back toward your shin until you feel a comfortable stretch in the arch of your foot. Hold 15 seconds and repeat 3 times. Plantar fascia massage: Sit in a chair and cross the injured foot over the knee of your other leg. Place your fingers over the base of the toes of your injured foot and pull your toes toward your shin until you feel a stretch in the arch of your foot. With your other hand, massage the bottom of your foot, moving from the heel toward your toes. Do this for 3 to 5 minutes. Start gently. Press harder on the bottom of your foot as you become able to tolerate more pressure. When you can stand comfortably on your injured foot, you can begin standing to stretch the plantar fascia at the bottom of your foot. Achilles stretch: Stand with the ball of one foot on a stair. Reach for the step below with your heel until you feel a stretch in the arch of your foot. Hold this position for 15 to 30 seconds and then relax. Repeat 3 times. Towel pickup: With your heel on the ground, pick up a towel with your toes. Release. Repeat 10 to 20 times. When this gets easy, add more resistance by placing a book or small weight on the towel.